Much of Africa's recent history has been marked by violence, but in recent years the continent has slowly stabilized, and more and more countries are starting to get used to peace. There are, however, certain areas are still being afflicted with war, and technology companies are being told to hold their hands up as being responsible. It's a sad truth that many of our hi-tech gadgets and gizmos contain components made of rare elements mined from countries where their sale fuels warlords and conflicts, including the African country of Congo. And a new report, Taking Conflict Out of Consumer Gadgets Company Rankings on Conflict Minerals 2012, puts Nintendo as the worst offender. 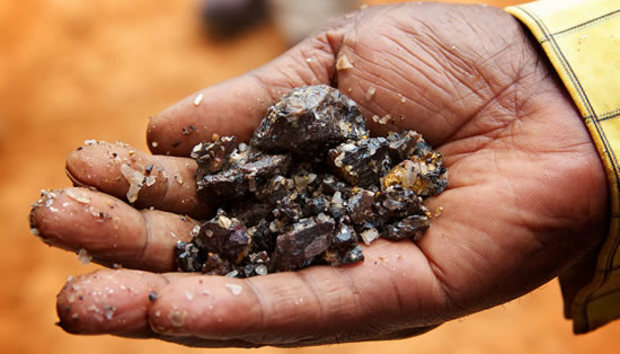 Issued by the Enough Project, the report rates consumer electronics companies 'on their efforts to positively invest in the region, as well as their efforts to remove conflict minerals that fund armed groups in Eastern Congo from their supply lines'. Eastern Congo is the scene of one of the most lethal conflicts since WWII. The war has claimed over 5.4 million lives, the figure touted in a study by the International Rescue Committee back in April 2007, with the toll mounting by 45,000 a month. What the figure is now is hard to say. The reason this is relevant to you and your gizmos is that many of the minerals used to power them are mined in Congo, and much like Blood Diamonds elsewhere on the continent (they have been called blood phones by some) the profits made from selling them goes straight into the coffers of warlords and militias, fuelling even more conflict. The materials this report focuses on are tantalum, often used for capacitors (especially in high performance machines), tin, tungsten (used in the vibration function of mobile phones), and gold, used in circuits. Collectively these are known as 3TG. Laptop computers, mobile phones, video game consoles, video cameras and digital cameras all contain conflict minerals. The big winners this year were Intel, Motorola Solutions, HP, and Apple. Labeled as 'pioneers of progress' in the report, the moves to reduce their reliance on conflict minerals include a smelter auditing program and an aid project for lagging smelters, direct sourcing and aid projects to help Congo develop a clean minerals trade, and tracing projects to dig deeply into their supply chains to identify precise numbers of smelters. "HP and Intel have gone above and beyond the call of duty on conflict minerals," said Sasha Lezhnev, co-author of the report and Enough Project Senior Policy Analyst. "It is now time to level the playing field for all companies, and the Securities and Exchange Commission has a key role to play in its upcoming vote on the rules for the conflict minerals law on August 22. The SEC should ensure that retailers and all firms that use the minerals are covered by the rules and that there is not a long phase-in period. Otherwise, the Intels and HPs will be left unfairly holding the bag for a problem that belongs to thousands of companies that have been turning a blind eye to this problem for years." Part the overall success has been the DoddFrank Wall Street Reform and Consumer Protection Act. The act means companies who report to the Securities and Exchanges Commission, or SEC, who manufacture products that require any of the 3TG minerals must report whether these minerals originated in Congo or a neighboring country. A study by Enough into the bill's effect on the ground found that it had helped lead to a 65% drop in armed groups' profits from the trade in tin, tantalum, and tungsten over the past two years, although trade in gold has increased dramatically. "The DoddFrank law is making a serious dent on the militias in eastern Congo," said Fidel Bafilemba, co-author of the report and Enough Project policy consultant based in Goma. "Miners, despite their lower incomes in the short term, support the reforms that will free them from the slave-like conditions they have lived through in the mines. Companies that have profited from the trade-electronics, jewellers, tin smelters-should establish a miners empowerment fund to increase employment in the region, including micro-finance for mining communities." The original conflict minerals report was published in 2010, and since then every company minus Nintendo has made strides in improving their rankings. Tracing, auditing, and certification have all improved, including systems that attach bar codes to packages of Congolese metals that have been certified as conflict¬ free. But there are other reasons for the improvement. "Much of the progress that has been made by electronics companies on conflict minerals can be attributed to direct consumer action," said co-author of the report and Enough Project Student Coordinator, Alexandra Hellmuth. "We are witnessing a mass consumer movement for the creation of a clean minerals sector in Congo. Not surprisingly, college students have emerged as the leading activists on this issue. Students from more than 100 college campuses across the U.S. and U.K. are advocating for their university's purchasing and investment policies to reflect company action on conflict minerals." The public are becoming more and more vocal on these kinds of ethical subjects. Protestors have demonstrated against Apple, outside the grand opening of Apple's new store in Washington, demanding that the company commit to using only clean minerals, while recently activists blanketed Intel's Facebook page with calls to support tough legislation to curb trade in conflict minerals. "Apple is claiming that their products don't contain conflict minerals because their suppliers say so," said Jonathan Hutson, of the Enough Project. "People are saying that answer is not good enough. That's why there's this grassroots movement, so that we as consumers can choose to buy conflict free." This isn't the first time the iPhone maker has faced the wrath of its patrons. After outrage from customers and sellers, some of whom threatened to pull its products, the tech giant had to agree to reinstate its commitments to the Electronic Product Environmental Assessment Tool (EPEAT), which awards certifications to products that are recyclable, designed to maximize energy efficiency and minimise environmental harm. Even among the list of losers there seemed to be some, if minimal, progress. The report explains how Sharp, HTC, Nikon, and Canon are taking initial steps to join industry efforts, but their progress remains far behind industry leaders. Panasonic, Canon and Sharp have all increased their scores from zero to the last report, a good sign that they're starting to do the right thing. Panasonic soared up the table's rankings, from joint last to 13th with a score of 33%. Nintendo trailed in last place with a miserable score of zero. For the most part, they refused to comment on any part of the survey. As far as any research shows, Nintendo has made no known effort to trace or audit its supply chain. Talking to CNN, senior policy analyst at the Enough Project Sasha Lezhnev said, "Nintendo is, I believe, the only company that has basically refused to acknowledge the issue or demonstrate they are making any sort of effort on it, and this is despite a good two years of trying to get in contact with them." In reply, Nintendo issued a statement saying the company "outsources the manufacture and assembly of all Nintendo products to our production partners and therefore is not, directly involved in the sourcing of raw materials that are ultimately used in our products." The company added: "We nonetheless take our social responsibilities as a global company very seriously and expect our production partners to do the same." Whether outsourcing or not, Nintendo's efforts aren't good enough. We live in an age where customer's protest not only outside your door, but with their wallets too. Nintendo's financial situation has been wobbly enough in recent years, and any sort of ethical boycott could be very costly. Elsewhere however, signs are good that companies are taking their corporate responsibility seriously. As things are, it might never be possible to be completely 100% free of conflict minerals, but innovations such as Graphene for super capacitors and long-life batteries may help wean companies off these rare metals. While it is not yet possible to buy guaranteed conflict¬-free products, if all goes well it's only a matter of time until blood phones are a thing of the past.